…so now it's your turn! Oh, first of all, sorry this is super late. I've been working my little tail feathers off trying to get the virtual Frugality Boot Camp online classes up and running (hooray! Victory!) and then it took me roughly 5 hours to do my Feeding Friends on a Dime post so I just ran out of time to get this important message to you. I figured you all wouldn't care – er, I mean, would forgive my incompetence. Post by FunCheapOrFree.com, the Fun Cheap or Free Queen. The goal is: don't waste a single drop of food or drink this entire week. If you pour it, dish it, make it, open it, or buy it, you must consume or preserve all of it! It doesn't have to be in one sitting, and it doesn't have to remain in it's original form. You can get creative and use it in different ways, reuse it in a different meal (like how I reused food all weekend with our guests) however you'd like. Just make sure none of it goes in the trash or down the drain! This includes drinks! Make a pot of coffee? Drink all of it. If you buy a fountain drink at the gas station, finish it! Can't finish it? Give to your spouse. It will show you that you are buying/making more than you need and will help you cut down on unnecessary spending and waste. Freezing counts. You don't necessarily have to EAT everything, but just do whatever you can to avoid the trash can. Leftovers? Toss it in a ziplock or tupperware and throw it – as is – in the freezer. Unused produce that's going bad? Blend it into a smoothie and freeze the smoothie, or toss the produce as-is in the freezer. You can even freeze dairy! If you eat at a restaurant, don't leave anything on the table! If you order a drink, drink it all! If they give you chips and salsa and you don't eat them all, ask them to bag up the leftovers for you and eat them tomorrow! I know we're in the middle of the week. Start this challenge today, and do it for 7 days, (whatever those 7 days end up being for you). If you have food that you absolutely can't eat for one reason or another (let's say you're leaving town), give it to someone who can! A friend of mine loves to trade leftovers with her neighbor, because she HATES eating her own leftovers. She'll take her dinner leftovers to her neighbor, her neighbor does the same, no food is wasted, but she gets a “new” meal to enjoy. If it's rotten, moldy, or half-chewed/spit out in any way, it can be exempt. Obviously. Leftovers aren't bad or gross. At all. In fact, they are delicious. Food often tastes better 2nd day because the flavors have time to meld. To open your mind and teach you to think creatively, and exhibit a second or two of conscious thinking before tossing anything out (food or otherwise). By making small conscious decisions such as trying to use up all your food rather than tossing it, it will save you – literally – THOUSANDS on your grocery bill. It's also to teach you about portion control. Our eyes are usually bigger than our stomachs (this is probably literal in my case, my eyes are huge…) so we tend to over-indulge and waste a lot of food. Give yourself and your kids only what you know you can eat, and you will waste so much less! It will make your kids better eaters. If we cater to their picky taste buds, it will only make it worse. Their eating habits are a result of what we choose to feed them! And of course, remember to play along for a chance to win $100 from Greg Black of Tencap Coaching! (remember his amazing post HERE?). 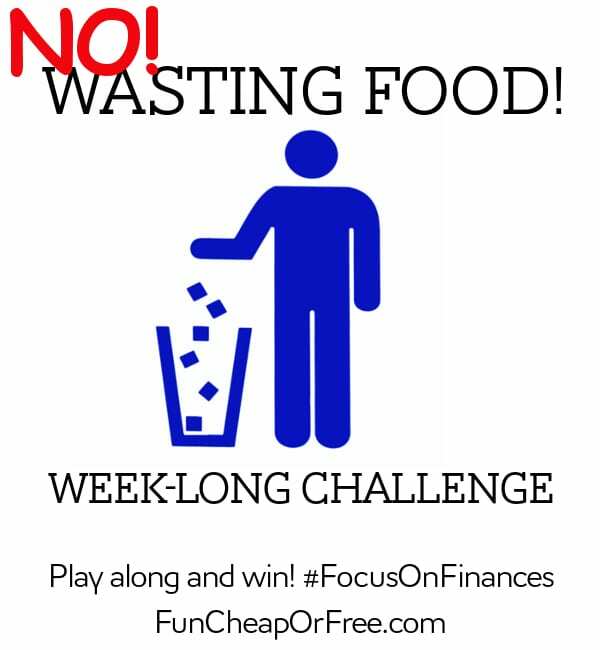 Just post pictures of your challenge progress to Facebook and Instagram using the hashtag #FocusOnFinances. One winner will be drawn at random at the end of the month. what perfect timing..although I sort of do this a fair bit anyway. But I am getting better/smarter at it all the time: for example, we just celebrated Australia day, with a BBQ for 50 people. Typically, there was mountains of meat left over, and whilst normally it would get left sitting on the table for the entire evening, and then given to the dog (having sat unrefrigerated, with flies taste testing it), this time, as soon as everyone finished eating, I popped it all in the fridge. The next morning, I was looking at the mountain of meat wondering what to do with it. my solutions: the sausages all got chopped into small pieces, to be frozen – they will be mixed with fried onions and gravy, topped with mashed potato and become sausage pie. the chevachipis were wrapped in strips of frozen puff pastry, oven baked and became dinner that night. the various bits of chicken and steak were all diced up and frozen, and will be used in fried rice. and the remainder was reheated for dinner the next 2 nights, along with all the left over salads. So from my pile of leftovers, we ate for 3 nights, and I have 4 more meals in the freezer. Great challenge! We’re really good about this too… except for eggs. Our son doesn’t always eat his egg for breakfast, and while sometimes I make him eat the leftovers as a snack, that only works if we’re home later in the morning. Plus, eggs are just GROSS cold or re-heated. Any ideas on how to use the leftover eggs? Scrambled eggs can be added to fried rice. Also, could you prepare the egg in a way that would keep better? Peeled hardboiled eggs can be popped into Tupperware and put back in the fridge . They will be just the same as is or can become egg salad sandwiches or chopped and used as a topper for tossed salad. Another option would be to make baked egg cups. There are tons of recipes for these on Pinterest. Basically you mix beaten eggs with meat, cheese, veggies etc and bake them in muffin cups. These can be store in the fridge to use as needed and stored again if unused. They work well for lunch boxes as well! I like your comments on the drinks. I use a Mr Coffee type coffee maker to make my tea in. If I don’t finish the whole pot in one day, I just turn the pot off before bed and turn it back on in the morning.